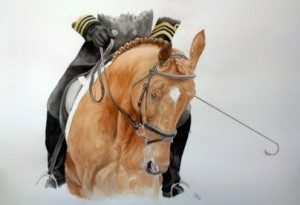 Pet Portrait Commissions, a watercolour painting, contain a lot of detail and therefore requires a good resolution photo of the animal to work from. I work mainly in water colour and these take me around 2 weeks to do one head study. I can work from owners photos if good enough, but also am able to visit to take photos as have a very good camera. The better the photo of the pet the better the painting. I make a small additional charge for visits according to distance and time this takes, but the client can visit me if the subject is a dog. I keep the client informed of timing, when I can make a start and send images during the drawing process before I start painting as a proof for the likeness. A 50% non refundable deposit is required for all pet portrait commissions to book a space and covers for some of the work as a guarantee for me to go ahead with the painting. The balance is only payable on completion and satisfaction. I will send an image of the final painting, but an image of the painting is not always a true representation of colour, size etc., so it is recommened to visit me at my studio to view and collect. It is also possible for me to post the pet portrait painting in a sturdy large tube so the painting isnt rolled too tight at an extra cost of the postage, usually next day delivery to cover insurance £7.95 tbc. An oil painting does take longer and postage will be a lot more for next day delivery as bulkier and can not be rolled of course. If you’re looking for a more affordable option you might like to consider an iPet portrait, you can find more details of these on the About iPet Portrait page.